This past weekend, the State Bar of Arizona carried out its Law Day event, which I mentioned before (and hope to report more on soon). 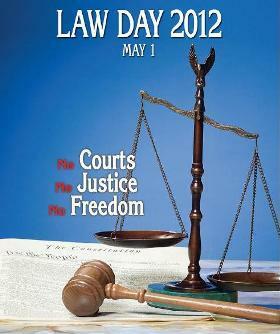 Law Day, of course, is a nationwide celebration of the rule of law. Communities and entities celebrate it in many ways. That makes tomorrow’s event sponsored by the Maricopa County Bar Association worth your attention. The MCBA’s event is titled “The Crisis in Court Funding.” That is an endeavor that brings attention to one of the most serious impediments to widespread access to justice. 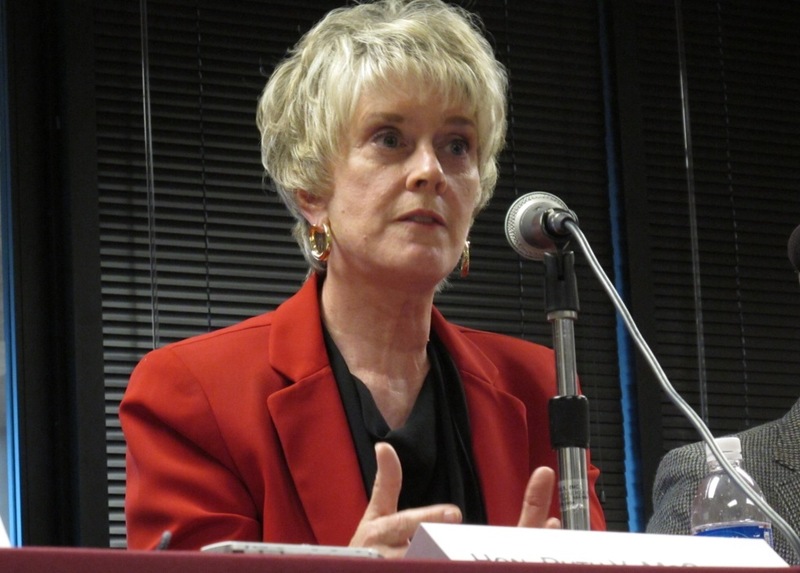 Among the panelists will be former Arizona Chief Justice Ruth McGregor. More information, and a registration page, are here. April draws to a close, and with it, our coverage of green topics for lawyers. So enjoy some sustainable reading here. Thanks again to lawyer Jennifer Mott for her amazing writing accomplishment. And in case you don’t receive the print issue in your mailbox, I share below my column from the May issue. As you’ll see, we at the magazine are examining our own carbon footprint. Are you? Is your law firm or employer? A time of economic troubles may seem an odd occasion to visit a topic like green law offices. After all, lawyers everywhere are scrambling for the best ways to survive and thrive in a global downturn. Trees and how to save them may not be top of mind. Today, there are some glimmers in the economic news that indicate a meager recovery may be in the offing. As that develops, lawyers will seek savings and smart practices wherever they can. And what we’ve dubbed “Earthwise Lawyering” may be a place to start. Jennifer’s coverage has been a spur to rethink our own paper use. Years ago, we examined the option of fully or partially recycled paper. But the cost was substantially higher, and fellow magazine-folk said the quality was spotty. Neither was the result we wanted in our member magazine. In 2012, though, cost is down and quality is up. Therefore, we will explore with our printer the use of various eco-friendly papers. Perhaps we might even achieve Forest Stewardship Council (FSC) certification (more information is at http://www.fsc.org/). Would you welcome such an outcome in your magazine? And have you made your own legal–environmental strides? Tell us your story at arizona.attorney@azbar.org. You may remain unmoved by the (melting) iceberg that is sustainable law practice. But here is a green story we all can support. For more than a decade, I’ve had the pleasure of reading the work of law students, courtesy of an annual competition at the University of Arizona Law School. And let me tell you—these greenhorns can turn a phrase. The other competition judges were Justice Robert M. Brutinel, Arizona Supreme Court; Commissioner Wendy Morton, Maricopa County Superior Court; and attorneys Troy Larkin, U.S. Customs and Border Protection, and Jeremy A. Lite, Quarles and Brady LLP. Thank you to the Law School for including me in this tradition once again. And congratulations to the winners. If your community is anything like mine, your morning may have been marked by the rush of speeding flower-delivery trucks. Each was laden down with bouquets of blossoms, all headed to lawyers and law firms focused on intellectual property. 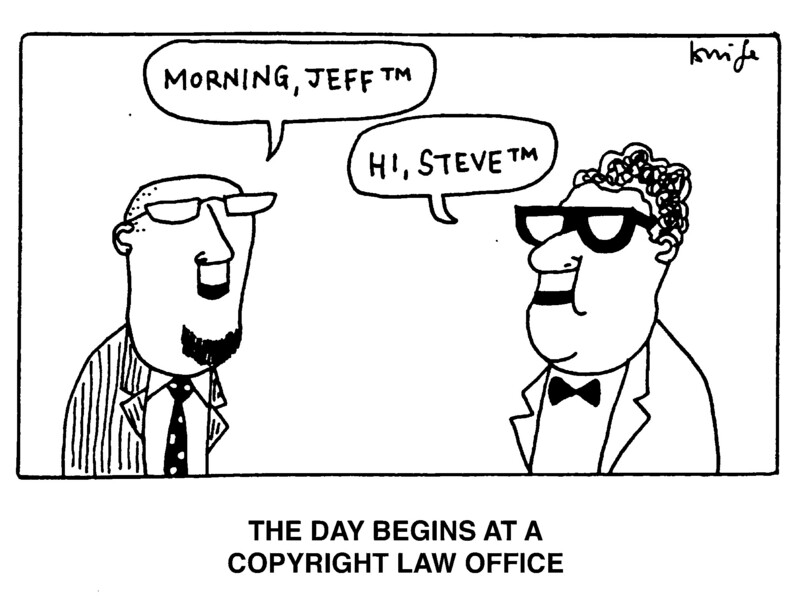 Today, you see, is World Intellectual Property Day (I’m sure I didn’t need to remind you). Tonight, the saloons and restaurants will be packed with IP attorneys, heady with the day’s festivities. Voices will be raised in passion amidst the war stories of obviousness, and copyright, and publication; they will not be estopped. So if you get the opportunity today, hug a patent lawyer and thank him or her for their work. Certainly, I jest, for WIPD is a real and significant occurrence. I take this stuff pretty seriously, so before you ask: Yes, I did pay the royalty fee to publish that great cartoon above! 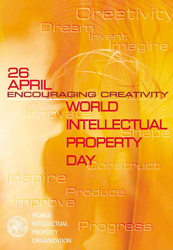 April 26 marks World Intellectual Property Day, an international celebration of the visionary innovation and creative expression fostered by the intellectual property system. The U.S. Copyright Office joins the World Intellectual Property Organization (WIPO), its Member States throughout the world, and our colleagues across the U.S. government in celebrating the significant contributions of authors and other creators to our global society. We are fortunate to live in a culture that values the talent and dedication of writers, composers, musicians, photographers, filmmakers, artists, producers and other authors. As the Supreme Court has noted: “The immediate effect of our copyright law is to secure a fair return for an ‘author’s’ creative labor. But the ultimate aim is, by this incentive, to stimulate artistic creativity for the general public good.” Twentieth Century Music Corp. v. Aiken, 422 U.S. 151, 156 (1975). We also live in an age of great technological innovation. This not only affects the ways in which authors may disseminate creative works and consumers may enjoy them—it affects the very means by which works are created and knowledge is accessed. And it calls for a robust legal framework for the 21st century—a framework by which authors are respected, investments (both intellectual and financial) are encouraged, enforcement measures are responsive, and limitations and exceptions are meaningful. 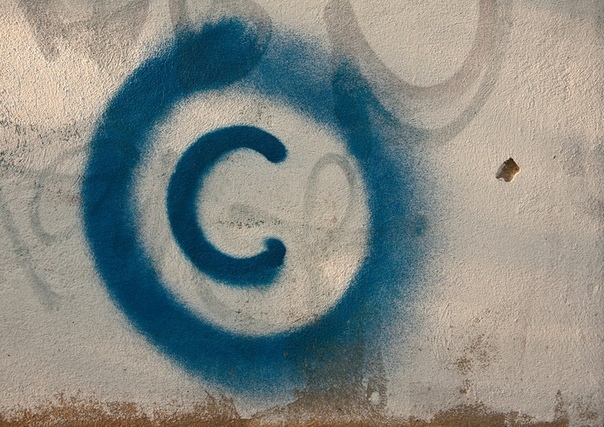 For more information about copyright law, please visit our website at www.copyright.gov. To learn more about WIPO, visit www.wipo.int. If you’re feeling the need to laugh (and who isn’t), a comedy concert may be just the ticket. 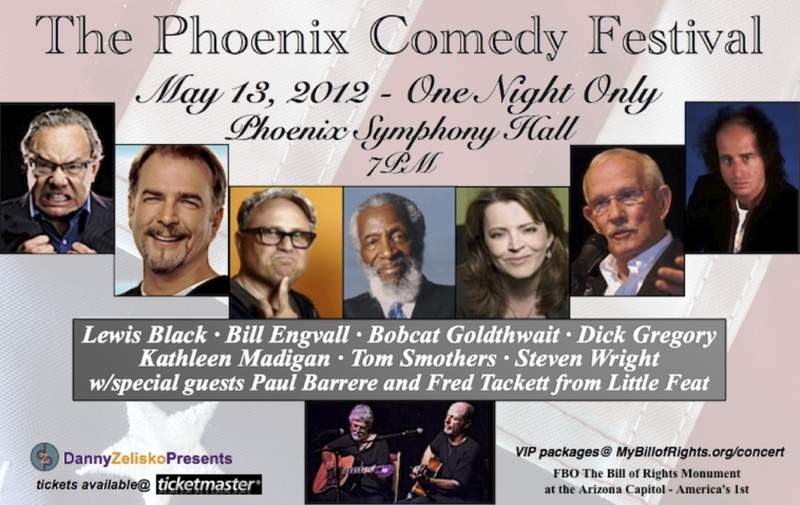 I’ve written before about the Phoenix Comedy Festival that is slated as a fundraiser for a first-in-the-nation Bill of Rights Monument. But today’s about the comedy, not the limestone slabs. So before you do anything else, you may want to click here to purchase Comedy Festival tickets. And while you’re at it, I’ve learned that there is a more direct way to get to the page where you can donate for the Monument (and even specify the amendment you most support!). That link is here, on the MyBillofRights website. And because I like to support good writing (and not just limestone monoliths), here is an Arizona Republic column on the topic by E.J. Montini. Funny, funny stuff. Let’s get laughing. It’s the patriotic thing to do. One of the more unique CLE offerings I’ve seen will occur tonight. 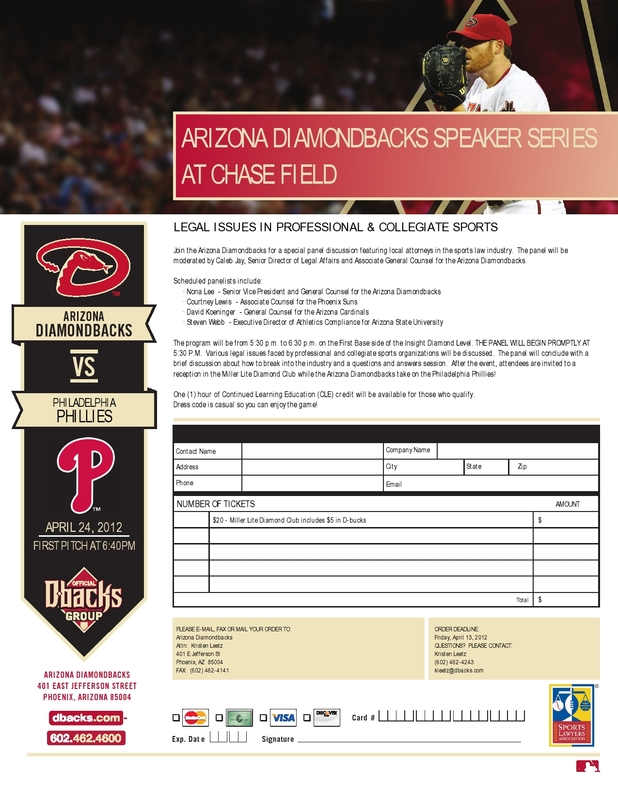 It is hosted by the Arizona Diamondbacks and will be held—where else—at the ballpark. The impressive panel is comprised of sports law attorneys (including the talented Nona Lee, whom we covered here in Arizona Attorney Magazine). After the 5:30 CLE, the first pitch in the game against the Phillies is at 6:40, and legal learners are encouraged to stick around for the matchup. Here is more about the CLE series. And the complete form is below (click to make it larger). For the very first time, AZ Attorney has a guest blogger. She is Fiona Causer, currently (as she describes herself) “a student pursuing her bachelor’s degree in Legal Studies … [who] enjoys writing and seeks to use it as a vehicle to convey ideas and engage others in discussing relevant issues of our day.” She writes here about social media and privacy issues. The opinions in the post are solely those of Ms. Causer. You can reach her directly at fiona.causer1@gmail.com. Are you interested in writing or collaborating on a guest post? Contact me at arizona.attorney@azbar.org. Paralegal Perspective: Is Social Media a Means of Voluntary Expression or Unwanted Exposure? In an era where near-constant surveillance of American citizens is a possibility, do online social media outlets really allow for free speech? In other words, if you know that people are monitoring what you say, can your speech really be considered free? For example, we’ve all held our tongue on Twitter, since we know that all of our followers will hear what we have to say and we don’t want to offend anyone. For folks in the United States, despite having the freedoms of speech and personal privacy granted to us by the U.S. Constitution’s Bill of Rights (e.g., via 1st and 4th Amendments, respectively), interpretation and practice can at times be unclear. This gives rise to many challenges for career legal professionals tasked with sifting through the ambiguity caused by an Internet-based world where personal information is not only widely accessible, but distributed quickly as well. While paralegal certification programs are growing in popularity with more people interested in entering the field of law, the issues created by online social networks will be sure to be a burden on the minds of future professionals in the field of law. So while we do try to bite our tongue at times to not offend or simply be polite, what happens if we just feel that everyone is listening? Will self-censorship increase if you knew your boss was listening, or if a government operative were monitoring your private Facebook emails. How does this relate to social media and privacy? In two recent instances, there have been cases where people are “listening” to what you’re saying online in a way that can only be deemed invasive. In the first instance, as reported by the Associated Press, employers are asking potential employees for their Facebook username and password, so they can have full access to the potential employee’s site – and should the job seeker refuse to provide his password, he may be denied employment. As this practice has become publicized, there have been some strong reactions. Facebook stated that under no circumstances should a user provide his password to another individual, since this practice violates Facebook’s user agreement. However, this does not directly address the First and Fourth Amendment issues of freedom of speech and freedom of privacy. The primary issue here is: Do employers have the right to monitor potential employees’ speech, and to investigate their privately-posted material? Senators Charles Schumer (NY) and Richard Blumenthal (CT) feel they may not and have requested that the Department of Justice investigate if the practice violates federal law. Additionally, some states are taking matters into their own hands. As reported by ABC News, Maryland has already passed legislation that makes it illegal for employers to demand social media passwords from potential employees. An even more troubling instance of monitoring was reported in Wired magazine by journalist James Bamford. His article regarding the NSA reveals that the United States Government is in the business of surveillance. 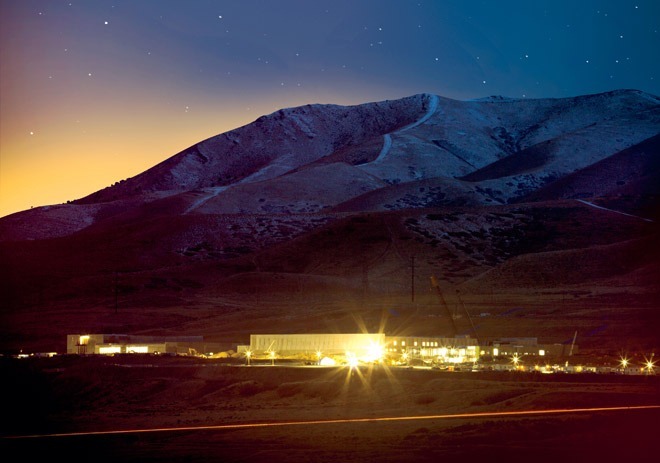 A $2 billion dollar facility is being built in Bluffdale, Utah, called the Utah Data Center. As Mr. Bamford reports, the purpose of the “listening center” is to monitor citizens’ (and foreigners’) emails, cellphone calls, Google searches and electronic purchases. The center will have enough data storage that, for example, all the phone calls and emails of a single person can be easily collected and stored. Meaning that anything you say has the potential to be monitored and later used against you. In such a situation, one justifiably wonders if soon one’s ideas and speech will be free at all. Were you seeking one last SB1070 event before the Supreme Court hears argument this Wednesday on Arizona’s controversial immigration law? If so, this evening is for you. Head over to the ASU Cronkite School at 6:00 tonight for a MALDEF panel on the law and its repercussions. Here is all the detail from the group. PHOENIX, AZ – MALDEF President and General Counsel Thomas A. Saenz will speak alongside a distinguished panel of legal scholars and advocates at a major forum discussing upcoming oral arguments before the Supreme Court in State of Arizona v. U.S., the federal government’s case against Arizona’s anti-immigrant law SB 1070. Oral arguments before the Supreme Court are scheduled for Wednesday, April 25, 2012. MALDEF and a coalition of civil rights organizations have been at the forefront of the battle to challenge all of the discriminatory and unconstitutional provisions in SB 1070. WHAT: Major Forum on upcoming Supreme Court oral arguments in State of Arizona v. U.S., the federal government’s case against anti-immigrant law SB 1070. Presentation and discussion will include: the major arguments from either side; impact on other pending lawsuits against SB 1070; amicus briefs; the make-up of the court; and other FAQs. WHO: Thomas A. Saenz, MALDEF President and Counsel, will be in attendance. Also speaking will be: Dan Pochoda, ACLU of Arizona; Evelyn Cruz, Arizona State University Law Professor; Crystal Lopez, DLA Piper; and Daniel Ortega, Ortega Law Firm. WHEN: Monday, April 23, 2012, 6–8 p.m.
MALDEF: Founded in 1968, MALDEF is the nation’s leading Latino legal civil rights organization. Often described as the “law firm of the Latino community,” MALDEF promotes social change through advocacy, communications, community education, and litigation in the areas of education, employment, immigrant rights, and political access. For more information on MALDEF, please visit here.